PARIS --- Armed Forces Minister Florence Parly announced at the Euronaval 2018 trade exhibition that France will execute the "FLOTLOG" fleet oiler program in cooperation with Italy. Four ships will be ordered, and the first two will be delivered before 2025. This joint decision enhances Franco-Italian cooperation in the field of surface vessels. The Director-General of Armaments, Joel Barre, and his Italian counterpart, Secretary-General of Defense Gen. Nicolò Falsaperna, signed tonight a Franco-Italian agreement for the construction of four logistic support ships ("Flotte logistique,” or FLOTLOG) in the presence of Florence Parly, Minister of the Armed Forces, and Elisabetta Trenta, the Italian Minister of Defense. France joins the Logistic Support Ship (LSS) program, which Italy has entrusted to the management of the Joint Organization for Co-operation in Armaments (OCCAR). OCCAR is already running several joint programs between France and Italy: either through cooperation between these two countries - FREMM multi-mission frigates and the FSAF air defense system - or through broader cooperation involving other countries - MALE-RPAS medium-altitude, long-endurance unmanned aircraft and the ESSOR software-defined radio program. The FLOTLOG program aims to replace the current single-hulled tankers of the French Navy, which entered service in the 1970s and 1980s, with modern vessels with double hulls, in accordance with the best international standards. They will support long-range ships deployed on the high seas (aircraft carriers, projection and command buildings, frigates) by supplying them with fuel, ammunition, spare parts and food. The French ships will adopt the design of the Italian ship Vulcano, currently under construction, and incorporating necessary modifications required to support the carrier group formed around the aircraft carrier Charles de Gaulle. They will be built by Chantiers de l'Atlantique in Saint-Nazaire, in partnership with Naval Group, particularly for the combat system. The hull sections that host the refueling system will be built by Fincantieri in Italy. 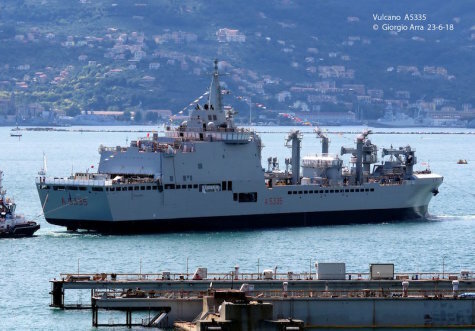 The French military programming law 2019-2025 provides for a target of four ships, two of which will be delivered by 2025.